A recent video clip of a stoat sussing out how to get onto the top of a picnic table where a kārearea (New Zealand falcon) was standing at Aoraki/Mt Cook National Park, sent shivers up my spine, no fear of the big bird on the stoat’s part. This was followed by a stoat darting around a lacebark half a metre away from where I was standing at our place. It showed no fear either, it was just looking at me, running behind the tree looking at me from the other side. 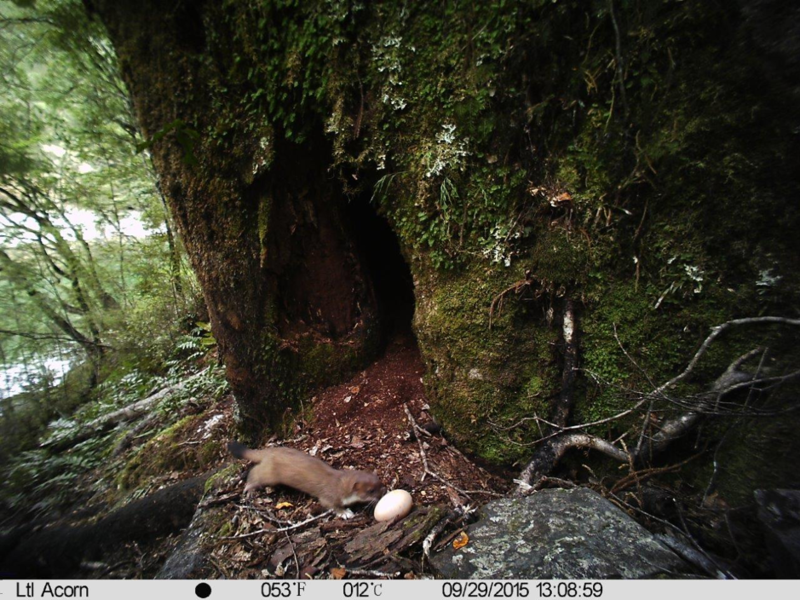 A stoat eats a whio (blue duck) egg. This happened until I called the dog and then the stoat disappeared. I am uncertain what the formula is for stoats, but if you see one there are several others around for sure. To date, we seem to have had little luck luring them into traps, and this is not for lack of trying, asking for advice and applying recommended baits. DOC scientist, Dr Graeme Elliott predicts a mast year, which happens when the temperatures during the summer are warmer than the year before. This results in heavy fruiting, and the best indicator trees for this are native beech. This year, kahikatea, matai and totara are also fruiting profusely. Tracking tunnels are then used to gauge whether rodents reach such high levels that they threaten birdlife. Predators, such as rats and mice multiply rapidly when there is a feast to be had in the autumn, and so do stoats that prey on them in the winter. When the seed rots or germinates in spring, starving rodents turn to birds eggs and nestlings, Following this the stoat numbers also explode and they too turn to birds and eggs for food. Elliott predicts this year to be the biggest mast year so far. 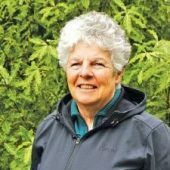 The Department of Conservation is, therefore, planning to control predators over one million hectares of native forest. In the absence of such predator control, small populations of kākāraki/orange-fronted parakeets, mohua/yellow head, rock wren, pekapeka/long and short-tailed bats, kiwi, kea, whio/blue duck and native snails would be most at risk. 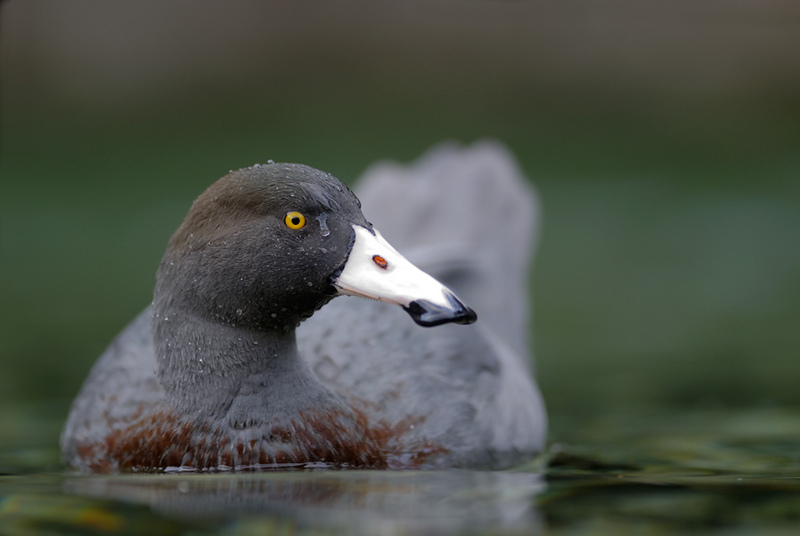 Blue duck are one of many native species that are at-risk during a mast year. New Zealand can’t rely on DOC to do all the predator control. While we don’t have rare species near our place, we are lucky to be able to enjoy korimako/bellbirds, tūī, pekapeka/long-tailed bats, lizards, and many other species, therefore we also have a responsibility to do our bit with predator control. Keeping cats inside at night would be a good start. Who wants rats or mice, these are trapped relatively easily? But the challenge for us is to lure the cunning stoats into our traps.